While the weather is still in winter, you may be starting to dream about spring. You can’t wait to get back outdoors and enjoy your Minneapolis outdoor pond and the sunshine. If you like to plan ahead, here are some things you can do now to get ready to open your pond in the spring. Once the snow melts, there are a lot of leaves and dead plants that will cover your pond and backyard. Make sure that you have a rake to get everything from the surface and a skimmer or pond vacuum to get the debris out of the pond itself. If you plan on putting plants and fish in your pond, you will want to start planning what plants will be best for your fish. Once it is warm enough to clean out your pond, a lot of the plants that were in there before will have to be cleaned out. Remember to get good fertilizer for your plants once they start growing in the pond. While many stores do not have summer plants out yet, now is a good time to start planning and get a jump on your backyard pond design. Whether your pond filter is tucked away or left outside all winter, you will want to make sure that everything still runs smoothly before you put it back in with your fish. Running your filter for a little while before setting it back up in the spring is a good idea to ensure the health and safety of your fish. If the filter broke in some way, it is good to know early so that you have time to get a new one before uncovering your pond. Once you’re ready to open your pond up for the spring, you’ll have to check the ammonia and nitrate levels of your pond along with adding any water treatment solution. Obtaining these materials now can save you a lot of time once spring comes. Chemical levels are important to check right away in spring for the health of your pond later in the summer. Get these materials early to tackle your spring relaxation. It is also important to remove your fish while treating your pond’s water. If you have any fish in the water over the winter, make sure you have a place to put them while treating the water in the spring. For any questions about materials that you need for the spring, don’t hesitate to call the Pond Doctor. All of us at DIWhy are ready to help you get ready for a nice spring and fun summer. When the colors in your Minneapolis home are old, worn-out, or in need of change, it’s time to repaint those walls. If you have painted interior walls before, you may already know about the preparation that goes into having great looking walls. If you’re one of those who are painting for the first time, here are some tips before you get started. Any home improvement store will have paint swatches. Find a few you like and put them up on the wall to see what the colors will look like in the light that fills the room. Some stores can provide small paint samples to paint on your wall. Painting these samples on small areas on your wall will allow you to see how that color works in the lighting of your home. You may decide on other colors depending on the light. Choosing a higher quality paint will not wear off like cheaper paints will after a couple years. Great, higher quality paints last longer and dry a better color. You will also have to choose between water-based and oil-based paints. While they are both easy to work with, oil-based paints are easy to mix and take longer to dry. Most of the time, water-based paints are used when painting the interior of a home. Even if it’s tarp or extra long pieces of cloth, any cover will work as long as paint can’t get through. Along with covering furniture, moving it away from the walls will give you more room to paint. If you can, putting furniture in the other room is the best idea while painting. Cleaning up your walls includes taking everything off of the walls, fixing any holes, and smooth out chipping paint. When fixing holes in your walls, consult a professional to find the right solution depending on the kind of hole. Using sandpaper to smooth out your walls should work well, as long as you dust off any shavings afterwards before you start painting. Removing the outlet covers will give your walls a cleaner look around the outlets. Store them somewhere safe to avoid losing the screws. There are many kinds of painting tape available, but most will get the job done if placed well. Make sure to line each border and cover the outlets with tape to avoid any accidents. Primer makes it easier to paint and provides a smoother finish especially when using oil-based paints. It also can help cover stains while evening out the paint later. Getting the right kind of paint in the style you want can be hard. Professional interior painters have the skills and equipment to perfect any interior paint job you have. Check out our interior painting page for more information on how we help you paint perfectly. Painting your Minneapolis home can seem like a time-consuming, pointless task. You might think that painting technique doesn’t matter as long as the color is pleasing. However, painting can be a helpful process that keeps your home healthier in the long run. Studies have shown that painting your home can prevent some areas from rusting, which contributes to a healthier and happier home. How in the world does it do that? These points can help you discover the benefits of a well-done paint job. To understand how rust can be prevented, we’ll start with how rust forms. Rust is the orange-brown discoloration on any metal surface. It forms when metal is exposed to oxygen and moisture for a consistent amount of time. Most rust is iron oxide, which means the metal, usually iron or any iron alloy, chemically combines with oxygen to form a corrosive material that eats away at the metal by combining with more oxygen. It breaks down the metal by becoming flaky. Different paints can be made out of various materials which affect quality and the best use in your home. Every paint has three main parts: pigment, binder/resin, and solvent. The pigment provides the color, but the others provide the form of paint. The binder, or resin, is what binds the solid pigment particles to one another to keep the color from washing off of your walls. Different kinds of resin can be used such as acrylic, polyester, epoxy, and others. Before the solvent is added, the paint is not very spreadable as the resin just makes it sticky. Solvent, which is most commonly water, makes the paint spreadable to go on paper or walls. Oil paints use a carbon based solvent, which makes the texture different from water based paints. How does paint prevent rust? The resin holds the pigment together, making a stickier substance that dries quickly and isn’t easy to separate. When this resin is on the metal parts of your home after painting, it dries to create a barrier from the oxygen and moisture in the air. In some studies, it’s been proven to provide the opposite reaction to oxygen, protecting the metal from rusting. Ensuring quality painting jobs is an important to the health of your home and family. If you’re ready to start painting the interior of your home this winter, we’re ready to help. Painting the inside of your Minneapolis home can seem like a daunting task for new homeowners or like a fun activity to liven up your home. In any case there can be times when you will want to hire an interior painter instead of trying to paint yourself. So what are the best times for hiring a professional? We’ve got the answers with our 5 best times to hire an interior painter. The winter months are usually the best time for interior painters because they have time and ability. Chances are that you’ll want to visit family before or after the holidays, which is a perfect time to allow the painters to do their jobs quickly. The weather is also a contributing factor to hiring indoor painters. They have the equipment to air out the paint while keeping the rest of your house warm. The larger the project, the harder it will be for you to complete in a short amount of time. Larger projects can consist of multiple levels of a house, tall walled areas, or multiple rooms. These projects can take up a lot of your time, making it harder to complete when needed. An interior painter can get these kinds of jobs done quickly and expertly while you put your feet up and relax. Walls that have been painted over many times can be harder to continue to paint on. Dark colors also have a way of showing through lighter ones. Covering up previous colors will create more work for you to get the right color you want on your walls without damage. Interior painters have the knowledge and skills to remove unwanted paint, or find a way to be precise with the color you want. Trim on the floor, ceiling, or window can be challenging to protect from unwanted paint. Taping perfectly can prove to be a difficult task. There are some trims in hard-to-reach places that create more work for you. Interior painters have seen all kinds of trim and have the expertise to handle those difficult to reach trim spots. If the home you live in was built before 1978, there is a chance that it was painted with lead-based paint. After 1978, there was a ban on the toxic paint, making homes safer for families. However, some homes might still have lead-based paint in them. 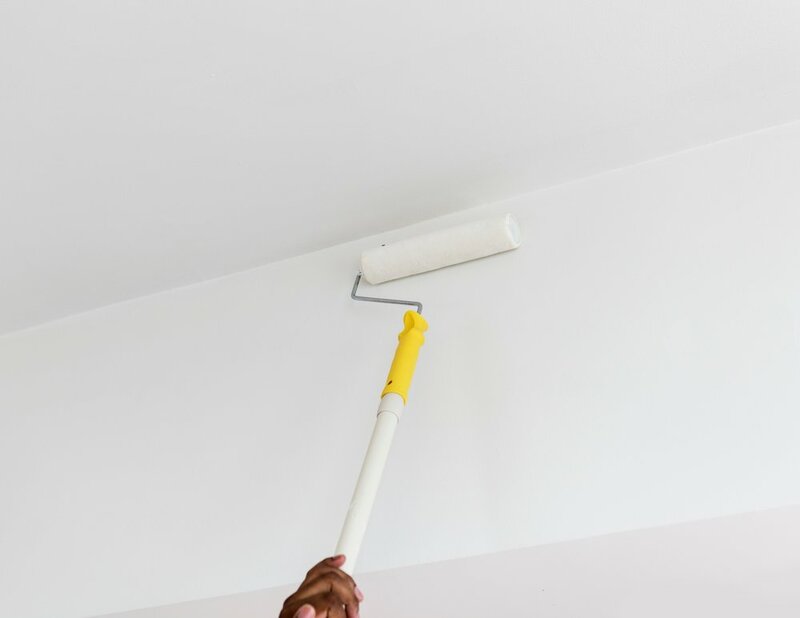 Painting over them will not get rid of the toxins, so it is important to your health and your family’s health to call a professional painter to safely dispose of the paint before painting over it. Whether you hire an interior painter for more difficult projects or to give your entire home a face lift, DIWhy is ready to make your house color dreams come true. Check out our Interior Painting page for more information or contact us for a free estimate on your interior painting project. Preparing your yard for the winter months is important when you live Minneapolis. When you have an outdoor pond, you’ll want to know how to prepare it for the freezing winter months ahead. Here are some simple steps to preparing your pond for winter. Before the weather starts to drop below 50 degrees, you will want to start lowering the amount of food you give your fish. That way, they will be prepared for the lack of food in the winter and survive until spring. An indicator that it’s time to stop feeding them is when the outdoor temperature drops below 50 degrees. If your pond is shallow, it is a good idea to bring your fish inside. Typically, ice will freeze around four inches thick, but can get up to ten inches or more. Dead plants and leaves can decay and poison your fish and other plant life if left in your pond over the winter. Rake out all the leaves and plants in your pond for healthier water in the spring. Living plants can easily survive the winter if properly taken care of. Plants that are more hardy can stay in your pond if pushed more than 18 inches below the surface of the water. If your pond is not that deep, it is best to remove all plants to a warmer area. More delicate plants, like tropical lilies, need to be in a place where they won’t freeze at all. Remember to keep them watered while inside. Most plants can be wrapped with damp newspaper to keep from dying and placed in a warm area. Ask the Pond Doctor for more tips on plant health to keep your plants alive over the winter. Removing any dirt and filth from your filter will extend the life of your filter year to year. To protect your filter from ice damage, you will want to think about moving it out of the pond for the winter. Make sure to drain all the water before putting it in storage. Another option is to move it closer to the surface of the water so that any bubbles it creates will keep the water from completely freezing. Because of our Minnesota weather, we recommend removing it for the winter. If your pond is at a depth where you cannot scoop out the dead plants and leaves at the bottom, it is a good idea to vacuum them out from the bottom of the pond. It will keep your pond healthier over the course of the winter and provide clean water in the spring. The last step is to cover your pond with netting or tarp over the winter. After all the cleaning you did, you’ll want to keep it clean until spring. The net or tarp will catch all the leaves and snow before it can get into your pond. Remember to clean off the netting or tarp every once in a while so that it doesn’t weigh down and fall into the pond. Following these easy tips will prepare your pond for winter, and help you rest easy until spring. If you’re ready to learn more about Fall and Winter pond maintenance, then we’re ready to help. Simply contact us for more information. Adding a waterfall to your backyard pond can impress guests and help you enjoy the peaceful atmosphere it provides. Waterfalls are a great feature to add to any Minneapolis backyard pond. Before you start designing your waterfall, it’s best to keep these 4 keys in mind. 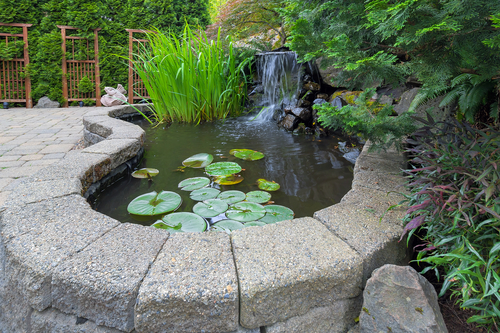 Rocks are an important part of your pond waterfall, but picking the right ones can be tricky. The most recommended rocks for waterfalls are flat and smooth river rocks. They are sturdy and make soothing sounds as the water cascades into the pond. Boulder-sized rocks are recommended for the main structure of the pond and waterfall. Remember that the structure of a well built waterfall is similar to stairs. You’ll want start with curved falls that land on flatter surfaces. One rock to avoid is limestone. Because they absorb more water than most rocks, there is a greater chance that algae will grow in the rocks. ﻿The slopes in your yard have a big impact on the waterfall’s foundation. If your yard has a natural slope, it will be easy to use it as a natural decline for the waterfall. However, if your yard is flat, you will have to dig and build to make an artificial slope. Another way to build a slope is to use multiple molds and concrete to form the right shape. A backyard pond landscape designer may be a good investment to guarantee a successful pond waterfall if you are concerned about placement and lawn care. Before you pick a location, be sure that it is near an outlet for the pump’s power source. If one needs to be installed, you will have to contact an electrician. One option is a ground fault circuit interpreter. Be sure to talk with your electrician about other options as well. An important note when picking the location is to place your pond and waterfall where you will most enjoy it. For most homes, that is near a patio or by the house. Its calming effect will soothe guests and make your own backyard experience more enjoyable. When building your own pond waterfall, there are a lot of materials that you might need. For instance, a rubber liner is needed under both the pond and waterfall to protect it. You may also need sand or gravel to line the pond or fill in the gaps between the rocks. Other materials include a hose, pump, and marine glue. The glue will come out as foam to expand and harden for the smaller gaps between rocks. Adding a waterfall to your backyard pond can be a great way to upgrade your backyard to a peaceful retreat. But, getting all the details just right can be a challenge. Here at DiWhy Exteriors, we specialize in backyard pond design. If you’re ready to start designing your backyard pond waterfall, the Pond Doctor is ready to help. Simply complete our contact form and we’ll be in touch to answer questions or provide a quote. Improving your Minneapolis backyard may include designing and installing a garden pond to help you enjoy the short summer months. Hiring a pond contractor is a big investment. You may be wondering what you need to know to choose the best guy for the job. We've got you covered with 4 questions to ask before hiring your contractor. You'll want to make sure your contractor has the right credentials. Most states require that backyard garden pond contractors are licensed in their state. In order to be licensed, your contractor will most likely need to be insured. Your project will probably require digging and heavy equipment so double checking licensing and insurance will give you peace of mind before you even start. 2. Do you specialize in water features? There's a big difference between a landscaping contractor that adds water features to a long list of services and one who specializes in ponds. Look for someone who is a specialist in ponds, water features, pond fish and plants. You'll typically get an experienced designer and installer who can confidently give you the best pond for your money. When it comes to designing and installing your backyard pond, you'll want someone with experience and who can get results. Feel free to ask about their experience, ask to see a portfolio of past projects, and testimonials or references. Most quality contractors will welcome a chance to show you their work and invite you to check on their references from past projects. 4. What can I expect from your pricing and process? Before your sign on the dotted line, you'll need a little more info. You'll want to ask for a quote or at a minimum how pricing will work. You can also ask about their process. From initial quote to putting your feet up and enjoying your backyard pond, your contractor should be able to walk you through their process, give you an estimated time line, and answer any further questions. If you're thinking about adding a backyard pond this summer, we're here to help. Tim, the Pond Doctor, works with you to design and install a pond that works for your yard and lifestyle. The summer months are the best time to enjoy your Minneapolis garden pond. As you get out and enjoy your backyard, we’ve got four summer pond care tips for you. Summer is the perfect time to add more plants that pop with color. Depending on your garden pond design, you can comfortably cover half to a third of your water surface. Be sure to keep fertilizing your plants, just like when you began your spring routine. These additional plants will add beauty, and ensure the overall health of your pond. Koi or goldfish not only eat mosquitos and other bugs, but they also help keep the water clear. Feed your little friends only as much as they can eat in three to five minutes. Any more than that can break down and cause complications in the warmer weather. Additional plants can help with any warmer weather complications. Warmer water will hold less oxygen for your fish. When you add plant cover, the additional shade helps keep the temperature down, increases oxygen capacity, and will directly oxygenate the water. Looking for additional ways to increase the oxygen in your pond? Consider adding a waterfall, fountain or other water feature. 3. Balancing Act: What do YOU enjoy? Every pond has its own personality, just like its owner! Do you like a pond design with a more natural look that evokes peace and tranquility? Or do you enjoy a more energizing feature that livens up your yard? The level of algae, plants, and wildlife (like koi and goldfish) can all be balanced out with the right addition of cleaners, filters, fertilizer and features. Summertime means a little more fertilizer and algae cleaners for most Minneapolis garden pond owners. One major upgrade you can take advantage of during the summer months is to increase the overall safety of your pond. While incidents are rare, a few landscaping elements and tools can make a big difference when children are present. Some safety upgrades can include purchasing a custom cover to put on when kids are present, or lining the bottom of the pond with rocks to prevent slipping on algae. You can also up your safety game by installing fences, or by making sure the sides are sloped. Fences and sloped sides make it more difficult to fall into the deep part of your pond. 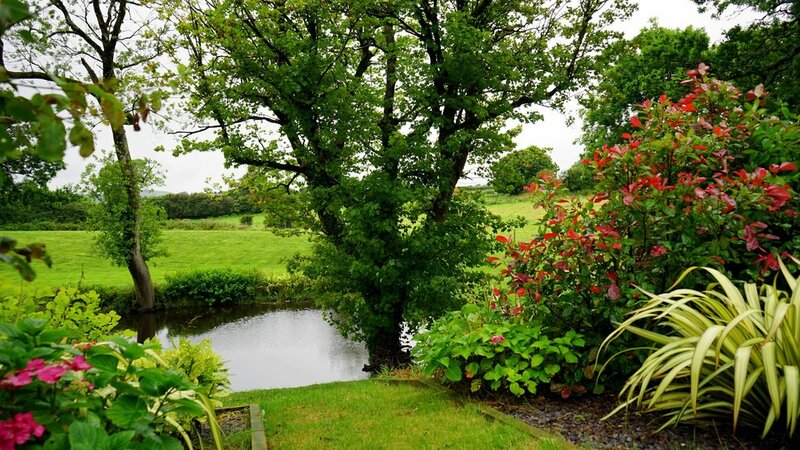 As with any of your garden pond design needs or ideas, we are here to help! You can get started with a custom pond or maintenance quote. As the temperatures rise, you may have already started your spring yard cleanup. If you haven't already done so, it's time to start spring cleaning your Minneapolis backyard pond. You'll want to start early and before the water temperature hits 55 degrees Farenheit. Cleaning after this time can produce unwanted bacteria that will be challenging to get rid of. So what do you need to do to start your spring cleaning? We got several helpful steps to have you sitting in that hammock and enjoying your pond. Once you've gathered your tools, it's time to drain your pond. If you have fish, you'll want to collect them and transfer them to a bucket with the old pond water before pumping. Once pond is empty, you'll want to clean the pond bed. 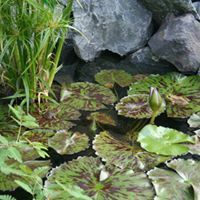 Remove any debris that has collected over the winter and trim any pond plants. 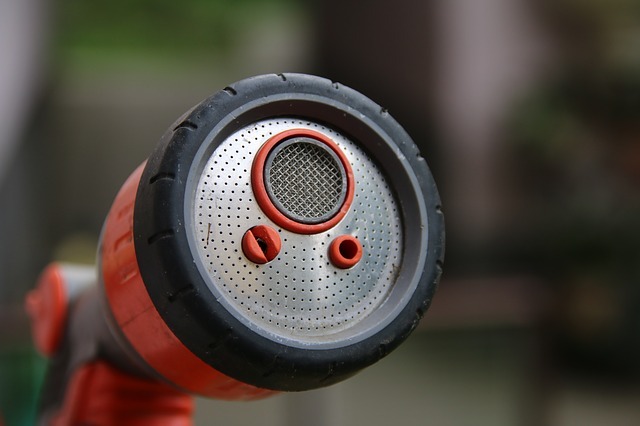 Use a high pressure nozzle on your garden hose to clean the pond. You'll want to wash rock beds and filters. Watch for water to start running clear. You can drain the dirty water with the pump again. Now that the pond is drained, it's time to wash and inspect your filters. You'll want to make sure you don't over clean as some bacteria makes for a healthy pond ecosystem. Now is the time to replace filters as needed. While some algae is beneficial for your pond, too much is not a good thing. You can clean algae naturally by adding shade to your pond with lillies and water hyachinths. Waterfalls are also a good addition to oxygenate your pond. Refill your pond with a garden hose. You'll want to test the water once filled. Your ammonia and nitrate levels should be at 0. Your pH levels should be between 6.6 and 8.4. You can slowly add your fish back to your pond (as long as your water tests pass) by floating buckets with fish and old pond water on top of your pond first. Next add a little new pond water to their bucket. This will acclimate them to new water temperature until they are ready to be returned to the pond. If you feel that you may need some extra help with spring cleaning or you would prefer spending your spring relaxing, call the pros. Contact Tim the Pond Doctor online or simply call 763-742-7948. As spring makes it's way to Minneapolis, you may be dreaming of ways to enhance your backyard experience this summer. A great way to spruce up your summer enjoyment is with one of these backyard pond ideas. Before you decide on a design, you'll want to choose a pond that fits your space and style. There are several things to consider before you start. Do you want an above ground or in ground pond? Does a formal or casual pond fit more with your style? Would you want to incorporate a waterfall feature? Do you want to include fish and plants in your backyard pond? After you've made some of these decisions, you're ready to consider the options. This casual looking pond can be an easy addition to your backyard landscape. Recycle a bathtub or purchase your tub new and get started with your design. For this design, you can keep the tub above ground in a rock garden or put in ground with a little digging. If your hot tub is no longer being used, you may be tempted to take it to the curb. But what if I told you that your old hot tub makes a great backyard pond. You can fill her up, add some plants and create a pond to relax by. Option 3 is a wooden raised bed. You can make a wooden frame, line with a pond liner, and start adding accessories to this backyard water feature. The simplest way to add a pond to your backyard is to use the space you already have. We help many of our clients install and design in ground ponds with liners. You'll want to design the size and space and get the proper equipment to maintain your pond all year long. Similar to the in ground with liner, the flat stone pond has decorative stone around the edges and creates a beautiful pond anywhere in your backyard. Ponds can be a lot of work, but are well worth the effort when you start enjoying your own backyard oasis. If designing and installing your own pond feels challenging, we're here to help! DiWhy specializes in doing the heavy lifting so you can sit back and enjoy your summer! Spring is around the corner and your Minneapolis garden pond has been lying dormant all winter. Many of our clients ask us if it's too early to start prepping their ponds for early spring clean up. While it may be too early to turn on your water filtration system (wait for 45ºF), you can still prepare your pond for spring and summer. If you're ready to get started with pond maintenance now, these four ideas will get you started until we reach that consistent 45ºF mark. Now is the time to start planning your improvements for the coming pond season. Think through any additions you wish to make like lights and native plants. Design a waterfall or fountain feature. Or add some accessories from our driftwood store. Take the early spring before turning on your water filtration to purchase the necessary supplies for your improvements. While you're waiting for the outdoor temps to rise, assess your inventory of supplies. Now is the time to stock up on tools you may be missing like nets for cleaning, waders, aqua gloves and extra tubing. Your pond's ecosystem is fragile in early spring. Organic materials in your pond break down as the weather warms up. You'll see a decrease in pH levels, and an increase in harmful ammonia. While you're stocking up on your pond tools, you should also invest in pH adjusters, biological additives, ammonia detoxifiers, and pond aeration. Inspect your filtration system and identify any replacement parts you need this spring. Check for filter cracks and kinks in your plumbing line. Replace any damaged parts, but wait to turn on your system until it's over 45ºF. Taking these steps will help make your spring set up much easier and ensure you enjoy your pond all season long. We know garden pond design and maintenance is a big job. If you're ready to hire a trusted pond guy, then we're here to help. As you begin to thaw out from our Minneapolis winter, you may be starting to think about the state of your yard. From greening up your lawn to planting flowers, spring in Minnesota means giving your backyard some TLC. One of the best ways to upgrade your backyard's look is with a fresh garden pond. Looking for some ideas when it comes to sprucing up your current water feature or designing a new one? We've got you covered with our garden pond ideas. If you're more of a traditionalist, then an in ground design with a pond liner is your best bet. These designs can be placed anywhere in your yard with the right structure and equipment. You can customize the shape, location and accessories to create the ideal pond design for your yard. Your existing backyard structures can provide a launching pad for an ideal garden pond design. Consider using existing brick walls, the wall of your home or shed, or even the edge of your deck to design your pond. Using an existing structure can help you place and plan your pond and can save on materials when you start the building process. Depending on the size of your pond design, consider repurposing items for your pond base. Some potential repurposed items can include your old hot tub no one is using, an old boat, metal tub, or planters. These items make great holding tanks for your pond and can give your backyard retreat a boost while staying in budget. Cold water species like koi or goldfish can liven up your backyard pond. These fish will keep your water clear by eating insects like mosquitoes and keep your water clear of algae. Driftwood can dress up your pond with a decorative feature. Visit our online driftwood store for unique driftwood pieces to decorate your current pond or design a new one. Enjoy your pond all evening long with lights that enhance your design. Choose from spotlights, garden lights on the outside perimeter, or even floating solar lights that sit on your pond's surface. Don't forget to put the finishing touches on your pond. Add some water lilies or other pond vegetation to put the finishing touches on making your backyard retreat beautiful. A well-designed pond can turn your backyard into a peaceful retreat in your own neighborhood. If you're ready to start designing your backyard garden pond, DiWhy is here to help and specialized in water features for your home. You’ve taken the time to select the perfect location for your backyard pond, and have chosen the fish that best suit your lifestyle. You love your backyard pond, and why wouldn’t you? After all, ponds are a great place to sip a cold drink near or to teach the little ones how to fish. But having a pond isn’t a one and done deal; it takes time and effort to keep the pond at an aesthetically pleasing status. A beautiful backyard pond makes your backyard more enjoyable and is sure to impress your family, friends and neighbors. So don’t let your initial hard work and money go down the drain by improperly caring for your pond this summer. Whether you have a koi pond, water garden or a larger pond, the following guidelines will help you keep your pond in tip-top shape. Or if you think you need some assistance, just call Tim! First thing’s first: you have to assess any damage from the winter and give the ‘ol swimming hole a quick spray down/scrub. This is most easily done by draining the pond. To do this, you’ll need a shop vacuum, boots, gloves, containers for fish, a hose and buckets. You’ll want to remove any fish in your pond before you start the vacuum so they don’t accidentally find a new home in the basin of your vacuum. Use a net larger than your fish to get the task done. Sweet tip: fish are more easily caught when the water level is low because the fish to water ratio is lower. Once all the fish are rounded up, turn your focus to the plants. Trim marginal aquatic plants to 1 to 2 inches above water level. For water lilies, trim back no more than 3 to 6 inches. Begin draining the pond by syphoning water with a hose or you can pump it. Once the pond is drained, remove any sludge or winter debris - such as sticks and leaves - that inevitably slipped through the protective net you installed in the fall (or should have installed in the fall). Rinse the lining and drain once more before refilling the pond. Leaks are possible in any pond – whether it be in the lining or equipment. If, when you take off the cover, you notice the water level is a little lower than it should be, it’s possible you have a leak. If there is a leak, there are a couple ways to find the location and troubleshoot the problem. To locate the leak, remove any pumps from the pond. If the water remains at the same level, the leak is likely in the plumbing or waterfall/stream. If the water level drops, the leak is in the main basin of the pond. To locate the leak in the liner of the pond, begin draining the pond. As the level lowers, check the liner for any gashes or nicks. For fast-flowing leaks, you can spray milk at the edges of the pond. Watch where the milky cloud goes. Milk will flow in the direction of the leak and remain cloudy where there is no leak. You can patch any tear or rip in the liner with kits found at most home and garden stores. If there are no leaks and/or after fixing any issues, you’ll want to top off your pond once a week so your fish aren’t stuck swimming in a one-foot by one-foot swimming pool. You may need to fill up your pond more or less often depending on the location of your pond and how big it is. You can fill up your pond one of two ways: snaking a hose from a spigot down to the pond or collecting water in a rain bucket. You can buy a rain bucket on Amazon or make one yourself with a trash can or some sort of bin, and a nozzle. Presto! After you’ve filled the pond and restarted the filter, test the water. Ammonia and nitrate levels should be zero, and pH levels should read between 6.6 and 8.4. Tester kits can be purchased at most garden center stores. While we’re talking about water quality, be careful not to spray chemicals near the pond. Toxins can seep through the soil and poison fish, other water creatures and plants. Even if you think you are far enough away from any seeping action, it can possibly still occur if the location of the spray is uphill from the pond. Be conscientious that water from a faucet contains nutrients that may speed up plant growth – and not all plant growth is good. But we’ll get to that soon. With summer comes longer days and more time for the sun to be out in full force cultivating plant growth. Those extra doses of golden rays also bring extra nitrogen to your pond, and weeds begin growing like wildfire! You have to keep on top of deweeding ponds just like a garden. Think about it – If all you do after tilling a garden is leave it alone and admire it, weeds will be sprouting up in no time. And that’s what happens in ponds, too. So after topping off the hub for your outdoor aquatic life, spend some time pulling weeds. Use a pool net to skim off any floating weeds. A stick or another long-handled instrument can also work to remove longer, string-like weeds. Just imagine you’re pulling hair from your shower drain! To maintain a clean, healthy pond, grab a handful or two of weeds from various spots around your pond. 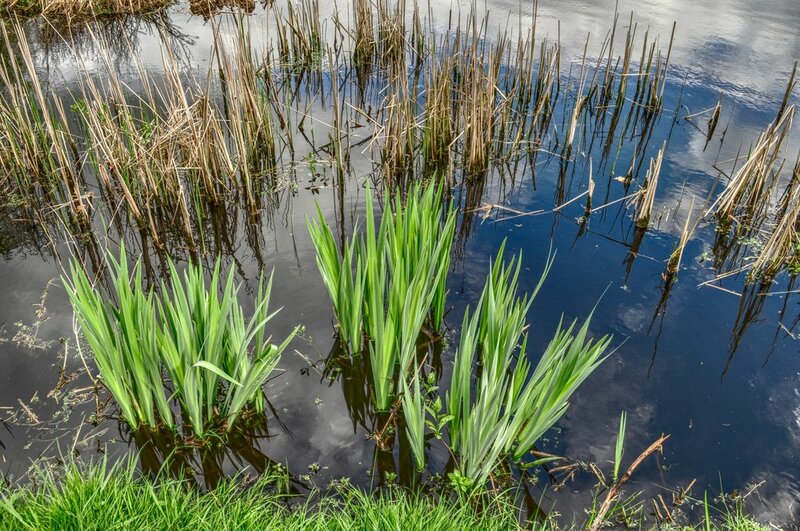 After you’ve done your weekly chore cleanup, make sure you leave the clumps of weeds near the edges of your pond. By doing this, any aquatic critters can make their way back to the water and not your trash can or composite pile. While you’re out ridding your pond of weeds, also do a once-over of any debris of sticks, leaves or other objects that don’t belong in the pond. Dead, dying or diseased leaves and foreign objects can discolor your pond and make it not so attractive. If you dedicate 5 to 10 minutes each week to pulling weeds and ridding it of any debris, you won’t have to spend several hours of your precious Saturday down around your pond combing and pulling weeds. In addition to clearing out weeds and debris from your pond, you want to make the effort to dealing with algae. Have you ever seen a pond with the glowing, slimy green hue? Or muddied water? You don’t want that. Simply put, algae can be a nightmare. And worse yet, there are thousands of types of algae. Now before you go pulling and skimming all the algae off your pond, the slimy goo can be good in small doses. Hear me out. Algae provides a more natural look to a pond’s landscape. And as a bonus, it provides food and oxygen for fish if maintained and controlled. However, if it isn’t managed properly, well, your pond will be the lesson to all other pond owners of what not to do. There are many solutions to combat the war with algae, from additives to clarifiers and sterilizers to phosphate removers. But if you want to go a more natural route to defeating algae, try adding shade in the forms of lilies or water hyacinths. A simple water change can cut back the algae; water high in nitrate fuels the growth of algae. Additionally, water decoration like a waterfall or fountain will help oxygenate your pond. Algae hates oxygenated ponds. Adding dye also cuts down on algae’s growth since it slightly clouds the water and sun rays don’t penetrate the water as deep. Fish are a beautiful addition to any pond. But the not so great truth is that they are waste manufacturers. And sometimes the amount of waste they produce harms the look of the pond and the fish themselves. On hot days, pond fish tend to be more active. Just like growing children, food helps them grow. So watching how much you feed your fish can help prevent a goopy pond. Feed them too much and they will defecate more and not live as long. You can avoid overfeeding by purchasing an automated food dispenser. Or, if you chose to feed fish by hand, give as much food as they can eat in five minutes one to three times a day. Summer is also a great time to add any fish, but make sure they will live in harmony with your current school of fish. A good rule of thumb is one average-sized fish for every three to four square feet of surface area. If you’re going the koi fish route, each fish needs 10 square feet of surface area. 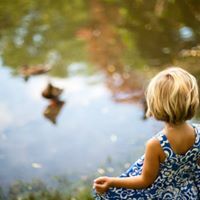 If you feel that you may need some extra help this summer as you take on summer pond maintenance or you would prefer spending your time relaxing by the Minnesota lake up north, call the pros. Contact Tim the Pond Doctor online or simply call 763-742-7948. Shutting down your back yard pond for the winter is an important step for every Minnesota resident. Follow the steps below to shut down your Minneapolis pond in preparation for another year of enjoyment starting next Spring. Shortcut: Just contact Tim and he can do it all for you! Use a thermometer to measure water temps throughout the late summer into the fall and winter. When the temperature starts to drop, slowly start changing the food you feed your fish. Wheat germ based food is ideal for this, as the fish can digest it even in the cold of winter, when their metabolisms slow down. As the leaves begin to turn color and start to drop now is the time to add a net to your pond to catch the leaves. Make sure the net has been securely fastened around the edges, but don't let it sag into the water, as this can be harmful for the fish. If you prefer not to use a net, spend 10 minutes each evening removing the fallen leaves with a hand net. Empty the net in the skimmer box as needed. Run your pump late into the fall as this will keep critters looking elsewhere for a place to hibernate during the winter. For a Minnesota pond, the first week of November is typically a good time to shut the pond down. However, this can change due to the weather. Remove the pump, filters and UV clarifier and store in the garage or basement. A good spray down from the garden hose is recommended prior to being placed in storage. Open any ball valves on your hose and blow out any low spots. Any sitting water in the hose is susceptible to freezing and thus cracking the hose and plumbing. Place a rag in the hose where the pump attaches to prevent critters from crawling up into it. If your pond is deep enough (38” or more) you will be able to winter over your plants in the pond. Prune any dead leaves and stems off of your deep water plants and move hardy plants around the edges of the pond into deeper water so that they will not freeze in the ice. If your pond is too shallow, you can place a bag over the pot and plants and store in your basement. If your pond is deep enough (38” or more) you will be able to winter over your fish in the pond. You will not need to feed the fish during the winter. Place a floating heater in the pond to keep the pond from completely freezing over. Add an aerator at the bottom of the pond to supply oxygen to your fish. Enjoy the winter and don't be concerned with the frozen water in the pond. That old water will be pumped out in the spring when it melts and you are ready to clean the pond. Also, the frozen water will help keep the critters at bay. Cuddle up and enjoy the beautiful Minnesota winter!